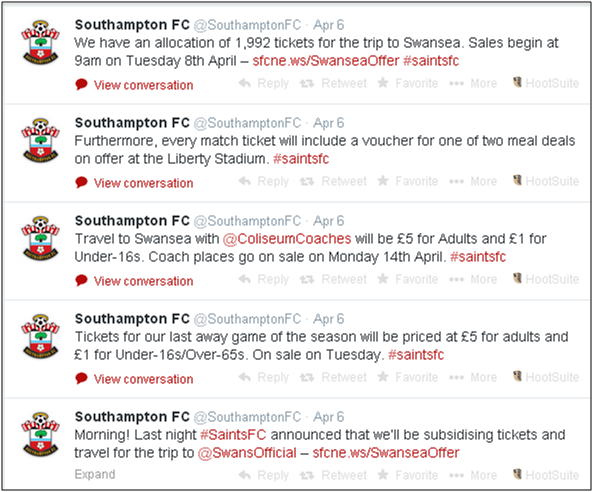 I was thinking about writing a piece about away fan activity in the Premier League anyway but then earlier this week Southampton announced they were drastically reducing prices for their final away game of the season at Swansea. Much is made on their site of it being a chance to ‘give back to fans’ but I’m a cynical guy and also know about the Premier League’s Away Fan Initiative. It’s often referred to as the Away Fan’s Fund (see BBC article) although that’s slightly misleading in that 'Fund' suggests some sort of ‘charitable’ donation from the Premier League, when in reality it’s a plan for all 20 Premier League sides to commit £200k each per year of their revenue for this and the next 2 seasons (so £12m in total) on the Away Fan experience. I can advise that the away supporters initiative was created for clubs to use to improve the experience offered to visiting fans. This could be used either for our supporters travelling to other clubs, or supporters visiting us. The £200k was not a donation by the Premier League to all clubs in the league, this is a top end figure that they suggested should be put aside to improve this experience. The £200k is paid for entirely by the club. Currently SFC have put money into improving the away fans concourse areas and provided supporters with a family fun day as part of the Fulham match day experience. We are still looking into further options for this, when decisions are made they will be announced on our website. This ambiguity of ‘Away Fan Experience’ has probably in part led to a wide variation in approaches from clubs, some have kept it simple with regular ticket discounts while others have taken a more proactive approach and others have seemed to sit on their hands. The Football Supporters' Federation have played a large part in getting this initiative set up and have details on their website of what some clubs have said they will do but I've also found a few examples from Fans Forums/Supporter Groups that highlight the vastly different attitudes to the initiative. It's not meant to be a comprehensive list or bashing certain teams but highlights that even something as seemingly straightforward as this ends up with a dozen different solutions. MB outlined the away fans’ initiative. Each club has set aside £200k. The Club could spend this money on its own fans travelling away, fans visiting Old Trafford or a combination of both. Kiosk vouchers for away grounds were discussed, as was the availability of transport for the disabled. But the most popular idea was a £5 discount on the cost of away tickets. The Club agreed to implement this and further investigate funding the remaining league matches that may not be covered (ie a £5 discount might just stretch to 16 games, assuming current allocations). Stoke have given free coach travel for the whole season and other clubs have gone for bigger discounts (or free/discounted travel) for specific matches. As a Swansea fan, I know the club have made a lot of effort with regards to the initiative and were probably slow to trumpet their work as I saw a greater amount of coverage of Newcastle and Aston Villa offering reciprocal price deals even though Swansea was the common link. Aside from reciprocal deals, Swansea have tried to have some sort of 'Thank You' at every game, ranging from free food to a free programme to discounted travel and free scarves. I appreciate the gestures and the effort made, but personally I'd rather the £3.50 (if full price is charged) that is being given to another club in return for a programme was used elsewhere as I'll discuss later. We spoke for a while about this initiative and the different approaches that clubs had taken to investing the £200k per year that has been set aside by the clubs to enhance the away match experience. Mr Elstone reiterated what he had said in previous meetings that this is supposed to be about filling the away ends of grounds. He noted that the ticket price subsidy the Club had announced for our own fans accounted for about 25% of the total spend. Additionally the Club would soon announce a new role of ‘Away Fan Ambassador’ who would be available 8am through 8pm on match days to support the needs of away fans including providing live updates (presumably through social media platforms) of things such as traffic and weather updates. He is though really frustrated by the actions of what he called the ‘less proactive clubs’ who’d used the whole £200k to simply knock a few pounds off tickets for their own fans, especially those clubs who have a 100% away following anyway and so their actions are very unlikely to increase attendances. He has (or will) asked the Premier League to be more specific about their expectation for the use of these funds as the scheme continues in 2014/15 and 2015/16. TC(Fans Rep): "What is the Away Fans Fund being spent on?" LM(Club Rep) explained that the Club has to disclose its spending in this area to the PL and will be doing so shortly. LM will also be attending a meeting with the PL and club supporter liaison representatives next week where this subject will be discussed and ideas shared. The board stated that it does not agree with the concept of subsidising away match tickets as this simply means it has to hand money over the home club, which doesn't discourage it from setting fair prices. Instead, the Club has pursued reciprocal pricing deals with other clubs but that this still represents a loss of revenue for those participating, which is offset against the Away Fans Fund. TC agreed with the principal of reciprocal pricing and thought it was a good idea. The Club disclosed that a significant amount had already been spent on the visitors section at St. James' Park this season, with the Away Fans Fund designed to be spent on the clubs' own fans who travel and the designated away end in their stadium. The Club is funding away travel for the Newcastle United Disabled Supporters Association (NUDSA) to Hull City next weekend, with tickets, travel, food and stewarding all provided. Gareth Beard explained that NUDSA was unable to travel in large numbers to other PL away fixtures due to the lack of available space for disabled supporters. The Club asked supporters to continue sending in ideas. The Club also noted guidance from Fans Forum members that discounted travel was not universally popular due to supporters who travel from different areas and on other forms of transport not standing to benefit. Since the above, Newcastle have now set up £10 discounts for trips to Stoke and Arsenal, possibly like Southampton have realised they need to get the £200k spent. Approaches by club therefore range from basic discounts to 'fan experience' activities to using some of the money to refurbish a clubs away end. Fans who support Everton away on a regular basis might argue that they'd rather had the extra £50-£60 back in reduced ticket costs but at least Everton appear to have a coherent strategy as to what they are doing with the money rather than blowing it all in one fell swoop. The moral of the story for me is that if you give clubs too much room to interpret what the reasoning is behind the initiative a some of them will look to tweak it to their own advantage. Personally I'd recommend a simple plan where an extra category of tickets is set up and 16-21 year olds ticket prices are set half way between Adult and Child. So for Swansea for example where Adult is £35 (for most games) and Child £17.50, introduce a £26.25 bracket. Obviously not everyone under 21 is poor and everyone over 21 rich, but this seems to me to be a simple way of encouraging the kind of people you want to keep coming to matches for the good of the game.